Born in Draperstown, Co Derry in September 1980, Vincent Kennedy is an artist working almost exclusively in the medium of liquid enamel paints. Very rarely using a brush, he instead drips or pours the paint onto the canvas. 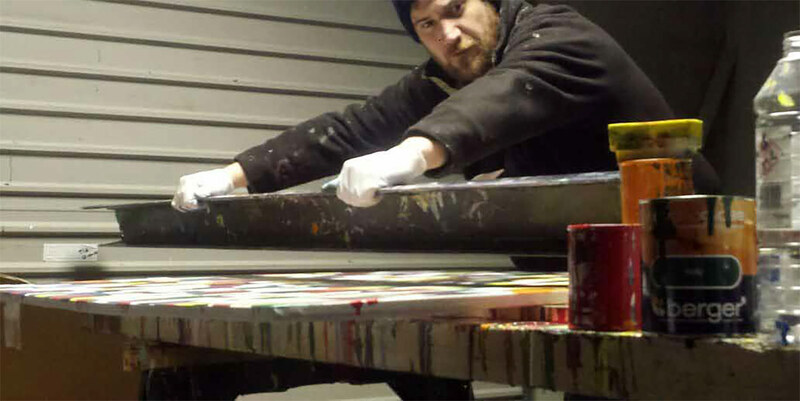 He also uses a squeegee to mould and shape the paints on his large abstract paintings. Vincent was artistic from a very young age and started drawing portraits in his early teens which developed into painting portraits in his early 20’s. Although a skilled portraitist, this form of painting did not satisfy his creative drive or emotional needs. After studying and researching different forms of abstract art, it was abstract expressionism that captured his imagination. Now working with complete freedom and high energy, and using bold colours, he creates works with spontaneous but often times subconscious direction. He has no fear of making drastic changes while painting but instead trusts his instincts and reactions to the image being created. Each of Vincent’s paintings is a voyage of self discovery and a unique insight into the artists psyche.